Those who love mountains know this, once you visit them they always beckon you back. Ever since my first tryst with Himalayas, which was a trip to Leh-Ladakh back in 2005, I have always wanted to see more of this vast and magnificent landscape. Was blessed to do the Mt. Kailash – Manasa Sarovar trip back in 2014 and in the month of July 2016 made it to Lahaul-Spiti. Arun Bhat, a good friend of mine and a well renowned photographer who runs Darter have been organising photography trips to Lahaul-Spiti for the past 4-5 years now. Had booked my trip to Lahaul-Spiti, back in 2013, with Darter, but had to drop out in the last minute due to a personal emergency. So this year, I did manage to join Darter on their Lahaul-Spiti trip and was ably led by Manish Lakhani, a great landscape photographer, and someone who has spent a lot of time in Leh-Ladakh-Spiti regions of the Himalayas. The scenic Spiti Valley is God’s special creation. It’s breathtakingly beautiful. Spiti literally translates to ‘The Middle Land’. It derives its name from its geographical location in between the Indian peninsular mass and the Tibetan plateau. The Spiti has imprints of Buddhist culture. It has the oldest monasteries of the world in Ki Monastery and Tabo Monastery, a favorite of Dalai Lama. Spiti is located at an altitude of 12,500 ft above the sea level. This barren cold desert of the mountains is eye-catching destination to a city dweller like me. Himachal Pradesh formed the district of Lahaul-Spiti in 1960 by merging two separate districts, Lahaul and Spiti. Before the two districts were merged, Kardang was the capital of Lahaul, and Dhankar the capital of Spiti. Kaza is the capital of the merged district now. Kunzum la or the Kunzum Pass (altitude 4,551 m; 14,931 ft) is the entrance pass to the Spiti Valley from Lahaul. It is 21 km from Chandra Tal. This district is connected to Manali through the Rohtang Pass. Spiti is more barren and difficult to cross, with an average elevation of the valley floor of 4,270 m (14,009 ft). It is enclosed between lofty ranges, with the Spiti river rushing out of a gorge in the southeast to meet the Sutlej River. It is a typical mountain desert area with an average annual rainfall of only 170 mm (6.7 inches). It is the fourth least populous district in India. Day 2: July 17th : Drive from Manali to Kaza, close to 230 kms, via Rothang Pass and Kunzum La. The longest travel, in terms of time, for the entire trip. Stay at Kaza. Day 5: July 20th : Visit Dhankar Monastery and Dhankar Lake. Back to Kaza. Day 6: July 21st : Head out to Chandra Tal. Overnight at Chandra Tal. Day 7: July 22nd : Head back to Manali. Day 8: July 23rd : Head back to Delhi and eventually towards Bangalore. There are numerous bridges that one has to travel on these beautiful, rugged mountain roads. 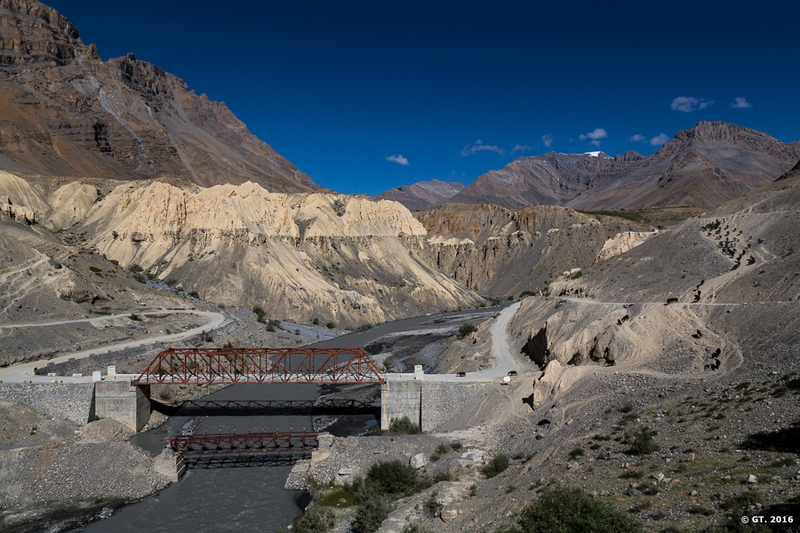 The cover photo of this blog was shot on the way back somewhere between Kaza and Losar. Losar, by the way, is known for its export of peas. This travelogue will not be a day to day tale, but has been organised around the major destinations of this trip. Below are the 8 posts about each of the destination.